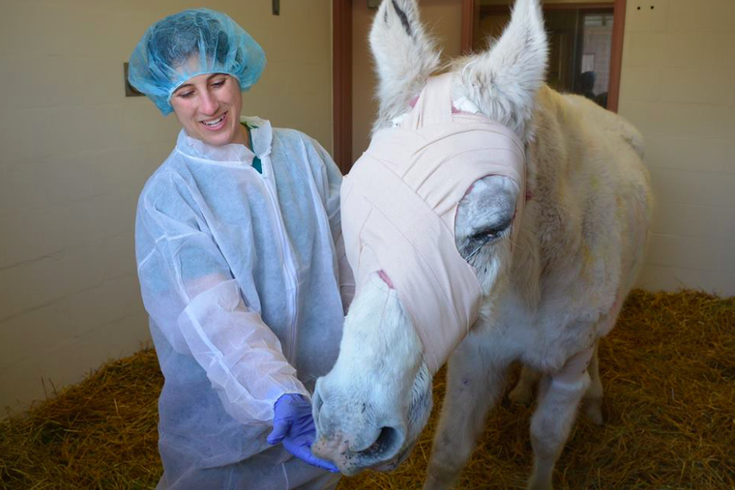 Penn Vet New Bolton Center surgeon Dr. Nikki Scherrer stands with 20-year-old Lily after successfully removing her sightless right eye. A Rhode Island man accused of transporting and later abandoning a sick horse at a Pennsylvania auction farm was arrested Wednesday and charged with animal cruelty as investigators continue to seek a suspect responsible for shooting the animal more than 130 times with a paintball gun. New Holland police charged 65-year-old Phillip S. Price with five summary citations in connection with his handling of Lily, the 20-year-old Arabian who was found abandoned, malnourished and abused earlier this month at the New Holland Sales Stable. According to prosecutors, Price transported Lily from New Jersey to the Pennsylvania auction site where most animals are typically sent to be slaughtered. Price, of East Providence, is charged with three counts of animal cruelty, one count of dealing and handling animals without a license and one count of importing animals without an interstate health certificate. According to the Lancaster Online, Price previously pleaded no contest to eight charges of animal cruelty in his home state of Rhode Island in 2015. He was fined and received 11 months of probation on charges that he kept eight of his horses in "conditions of filth," said an officer with the Rhode Island SPCA. The Pennsylvania case was investigated by the Lancaster County SPCA, which continues to offer a $10,000 reward for information leading to the arrest of the suspect responsible for shooting Lily. The Humane Society of the United States and PETA together contributed an additional $9,000 to the original reward. After Lily was discovered, she was placed under the care of Penn Vet specialists at the New Bolton Center in Kennett Square. Surgeons removed her right eye to relieve her from chronic pain associated with an ulcer. Earlier this week, Dr. Nikki Scherrer provided a Facebook Q & A update on Lily's condition. "Lily has been doing really well. The tests were negative for [an] infectious disease, so she should be able to get out of isolation this week ... She definitely has some vision. The ulcer still is not healed. That is our biggest hurdle. The eye is improving every day, so we have been able to back off of her pain medications." All inquiries about adoption and donations are being handled by Omega Horse Rescue, an Airville-based nonprofit rehabilitation center. Anyone with information about the individual(s) responsible for Lily's attack is urged to call the Lancaster County SPCA at 717-917-6979.